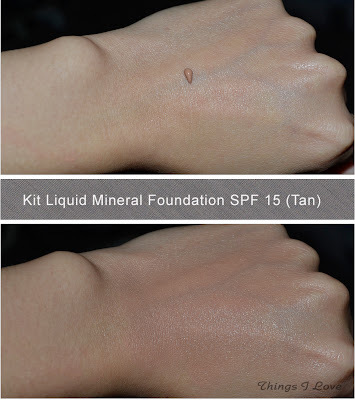 If you love the mineral foundation, but hate the mess that loose minerals cause all over the vanity or bathroom table, then you'll rejoice the fact that some clever soul solved that problem with the creation of liquid mineral foundations. They go on like normal liquid foundation but dries to a powder finish and give you the same silky soft feel and the benefits of natural sunscreen ingredients that are often associated with mineral foundation. Not only that, these foundation are generally minimalists when it comes to the ingredients list and are less likely to cause irritations on sensitive skin types. Kit recently put out such a foundation and I had the opportunity to try it during my makeover last month. Contains minerals that help protect skin all day by giving physical sun protection with zinc oxide and titanium dioxide.The finely milled minerals also act as light diffusers to soften any imperfections on skin and give you an even and flawless base. The oil-free liquid formula is mess free and dries to a powder finish in about 3 minutes time, enough for you to do the blending work on your face before it sets. Because it sets to a powder finish, no additional setting powder is required unless you have very oily skin and want that extra shine absorption protection. Lightweight and breathable it also contains vitamins A, C and E to condition and protect skin as well as hyaluronic acid to hydrate throughout the day. 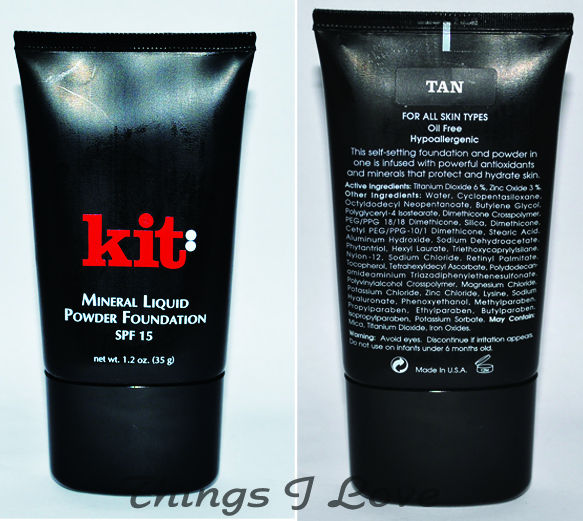 Kit's formula give a velvety smooth finish with excellent coverage. As you can see on my hand, all the uneven skintone and some minor sun spots I have is easily covered by that single drop of foundation and this lasts through more than 9 hours of normal wear on my face. 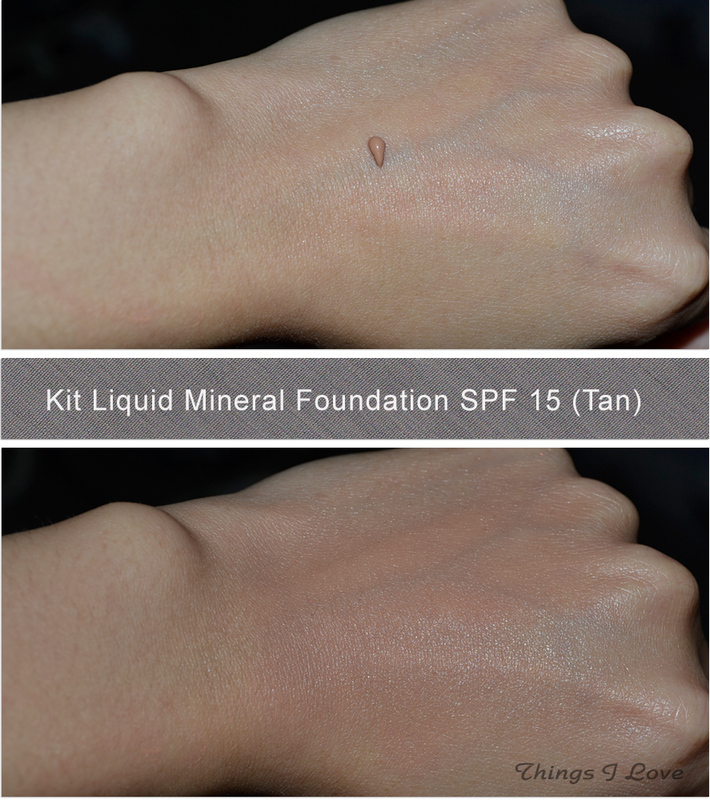 This liquid mineral foundation is more sophisticated than most and it shows in its ingredients listing being quite long as there is a built-in primer and added moisturising complexes; those who like minimalism in their mineral foundation ingredients will have to decide if this suits them. Personally I love the feel and finish and ease of use of this foundation so if I could find a better colour match (with only 3 shades, the choice is quite limited), this would be my foundation for flawless smoothness that stays put all day long. I was colour matched to Tan but as you can see, this is too dark and would be more a deep summer shade for my skin. If they expand their colour availability, I'd make this my everyday foundation in a heartbeat. Available in 3 shades: Light, Medium or Tan. RRP A$44.95 at Kit Cosmetics counters, Mecca Maxima or online. Rin - if you find a colour match this is definitely a keeper!